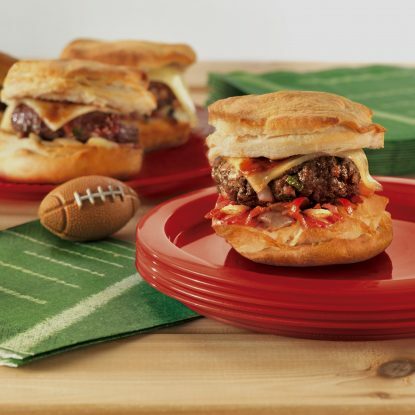 When the Super Bowl kicks off, do you know what you’ll be serving your guests? These Super Bowl appetizers and recipe tips won’t break the bank or bulge your waistband. 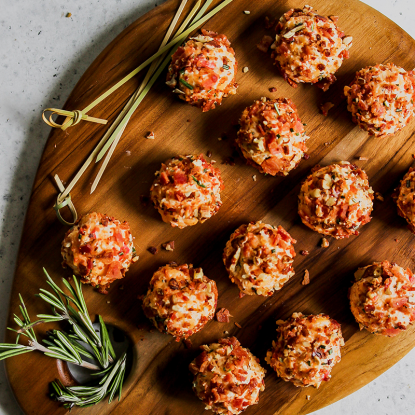 Love tailgating appetizers? I’ve collected my favorites here in this Ultimate Tailgating guide! 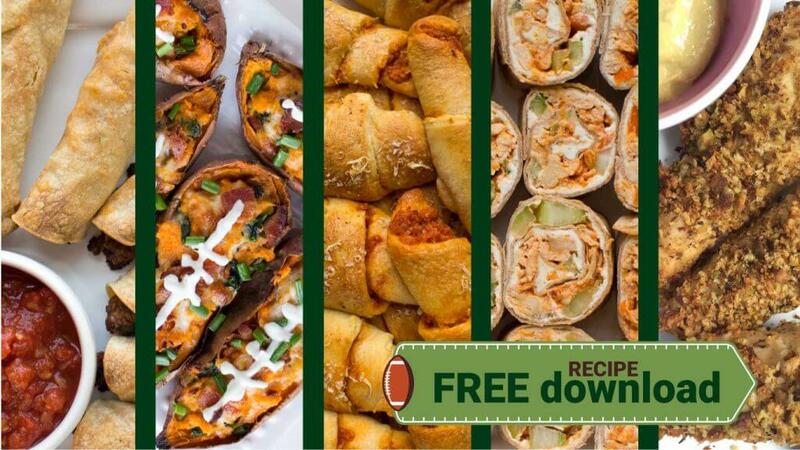 While you’re on my Ultimate Tailgating page, be sure to grab the free download for even more recipes!! There are many things about Sprouts and Whole Foods but one thing I particularly nerd out over when grocery shopping is their bulk bins. Bulk bins are packed with a variety of nuts, seeds, grains, chocolate-covered everything, dried fruit, spices, granolas, and more. Best of all, you can’t beat the prices. This is where I always go to buy my almonds and cashews. 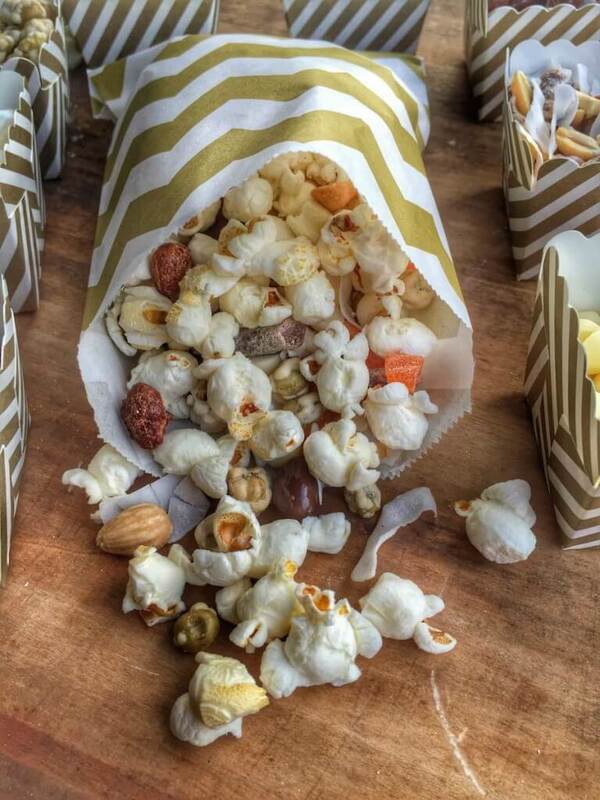 When I decided to create a Gourmet Popcorn Bar as a fun Super Bowl appetizers that also works for birthday parties, cocktail parties, etc., I knew that I had to hit the bulk bins because they would save me time, money, and peace of mind. Since mindless eating and Super Bowl snacks essentially go hand-in-hand (just being honest…), I thought air-popped with some fun add-ins would certainly be a better but just as tasty option to heavy dips and chips. 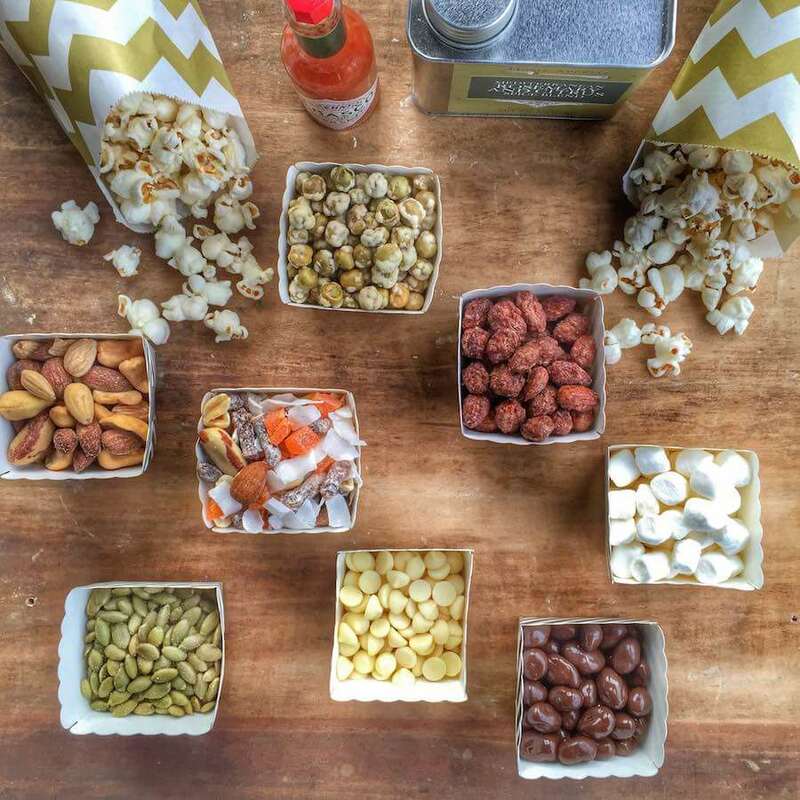 To set up your Gourmet Popcorn Bar, either pop your own or buy air-popped popcorn then pair with a variety of sweet and savory toppings. You can also add dried or fresh herbs and spices (sweet, salty, and savory) as well as drizzles such as truffle oil, maple syrup, caramel sauce, or tabasco sauce. The stir-in options are as endless as there are cute ways to present this idea. I found these little boxes and bags at World Market but think if you wanted to work ahead a little, you could preload popcorn into mason jars (with lids to keep it fresh) and then set up the toppings right before your event begins. Whatever you choose, you’re guests are sure to be wowed! Chicken and waffles have become quite the rage at brunch restaurants over the last few years. Make them miniature for an easy pick-up appetizer by using mini frozen waffles and frozen chicken nuggets. 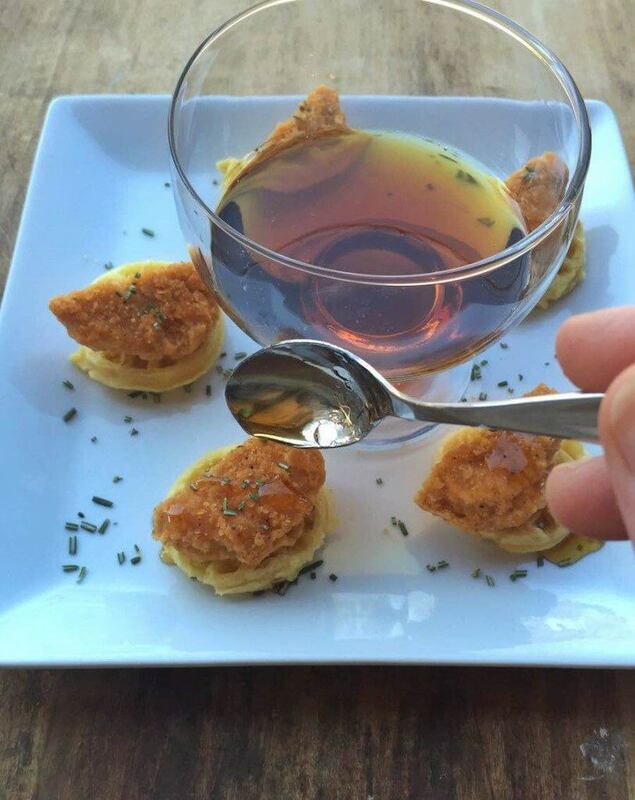 These Mini Rosemary Chicken and Waffles are as tasty as they are cute. Plus, you can’t beat the convenience of using pre-made ingredients to cut back on time and dishes. If you were ever to peak in my window at lunchtime, odds are every few days you’ll see that my lunch is ham, cheese, and maybe some hummus wrapped up in lettuce. 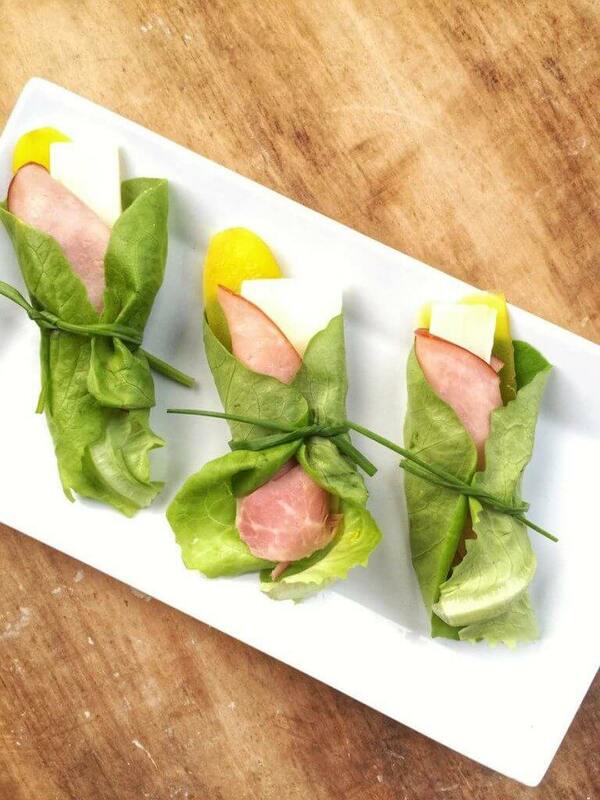 Granted, it rarely (or ever) looks this pretty but I thought that amplifying basic deli ham into a crowd-friendly appetizer would be perfect in a little pick-up lettuce wrap. Plus, butter lettuce has a very mild flavor so the ham becomes the star and isn’t hidden by the bread. To make these sandwiches, I simply used a butter lettuce leaf and then layered the ingredients down the center including ham, cheese, and a pickle and then tying closed with a chive. My family grills out various sausages and vegetables quite often at the lake during the summer as an appetizer. After Dad takes it off the grill, he slices it into rounds, puts everything on a platter with toothpicks and serves with mustard, BBQ sauce and other dipping sauces. 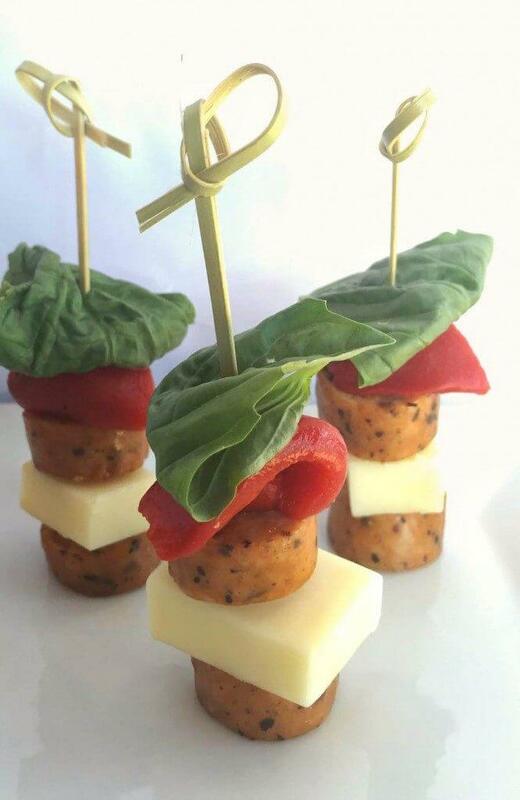 I always end up layering flavors and ingredients so I thought that skewering sweet Italian chicken sausage with fresh basil, mozzarella cubes and roasted red pepper would almost taste like lasagna on a stick. Plus, they stand up on their own and are just too cute! There aren’t many people that associate wanting to eat “healthy” while watching the Super Bowl but what if I said you could have a hot dog while you do it? And not just any hot dog but a 100% beef hot dog? 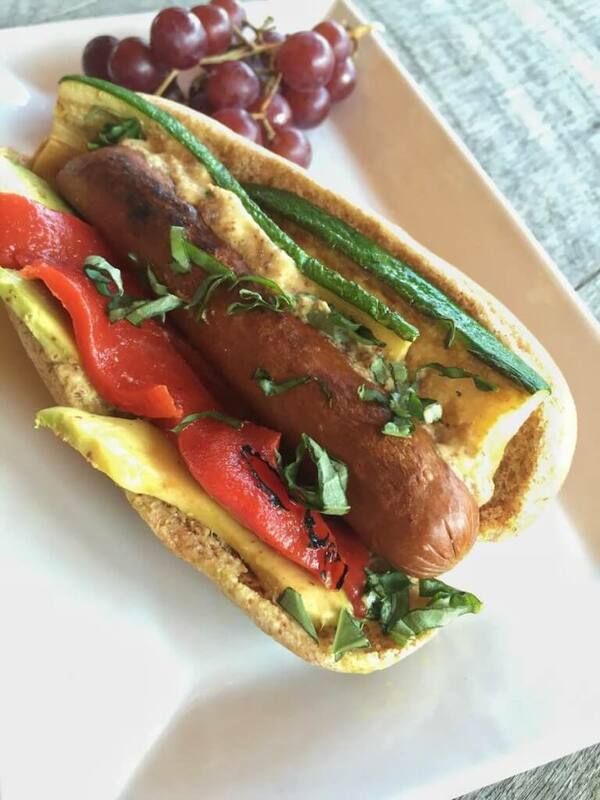 In an effort to pile in more veggies while that “mindless eating” is taking place, I’ve loaded these organic, uncured grassfed hot dogs with the “healthy stuff” like grilled zucchini, roasted red pepper strips, avocado, and fresh basil. You can easily top with what you have on-hand or even left over like grilled onions, carrots, and radishes. If you love these recipe ideas then never dig for them again by pinning the above pin to your favorite Appetizers board. 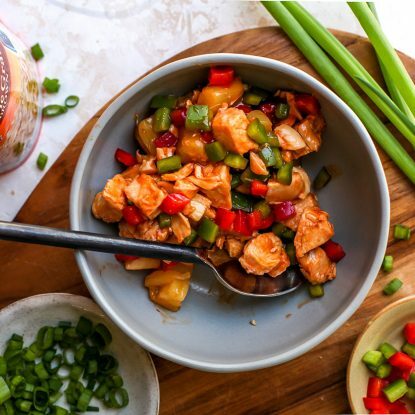 And while you’re on Pinterest, check out account with more of my recipes and favorite family-friendly, entertaining, and inspirational recipes and ideas from around the web. I would love to connect!